Estate planning at the Law Office of Kelly B. Myers is not one size fits all for everyone. We offer different levels of planning to suit your varying needs. When you come in for your initial planning meeting, we will help you determine the level of planning best suited to your family. Every plan, at a minimum, includes a will, power of attorney, health care power of attorney, HIPAA designation and, if appropriate, a living will. These minimum planning documents are essential to any plan and are custom tailored to every client individually. For families with minor children, we also include comprehensive guardianship planning, where we help you name legal guardians for your children for all stages of life. We help you prevent your children from ever being taken into protective custody, help you plan for the event of your incapacity, and plan for the long term care of your children should you pass away. Guardianship planning is often overlooked, but is an essential element of planning for families with minor children. 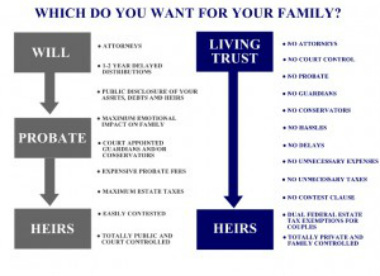 Most of our clients also benefit from the creation of one or more revocable living trust. Once funded, this type of trust can prevent your assets from passing through the long, expensive and public process of probate. It can also protect your assets from the reach of future creditors, ex-spouses, and others who may want to take your hard-earned assets. A trust can also help you avoid estate taxes, whether or not they may be apparently due. If, like most Americans who have been in the workforce for a number of years, you have significant retirement assets, we also recommend a special IRA trust that will allow your loved ones to continue to benefit from those assets for many years to come as opposed to forcing distributions over a limited time-frame. For clients who may be caring for children or adults with special needs, disabilities, or other unique needs, we recommend the creation of a special needs trust to hold assets for that individual, providing for their care, and maintaining eligibility for various government assistance. For the more complex plans, or for clients who don't have the time or desire to fully fund and implement their plans, we will personally handle the funding of each trust included in your plan so that you have nothing to worry about. These types of planning tools are the most commonly used in our practice. However, we look individually at every client's circumstances to determine if less common or more specialized planning techniques may benefit your family. Our goal is to ensure that you do more than put an estate plan in place. Our goal is to make sure you have the plan that best fits your family and that it continues to work over time, which is why we review our plans at least every three years FREE.